BASIC has presented its latest study during the French Fair Trade Fortnight : « The Dark Side of Chocolate » explores the value distribution in global cocoa chains, evaluates the social, health and environmental impacts generated in Ivory Coast and Peru, and estimates the hidden costs offset on society; it also explores to what extent Fair Trade can be a solution to the issues at stake. The ever-expanding chocolate market fostered the emergence of industrial empires in cocoa processing and chocolate manufacturing. However, it is unsustainable both for producers and the environment. The standardisation and massification of cocoa production created an abyssal asymmetry between a handful of transnational companies and millions of small farmers who do not have access to information on market trends, and very little capacity – if any – to negotiate the price they receive for their cocoa. This downward pressure maintains most of the producers below the poverty line and pushes them to develop short-term strategies in order to increase their income: chemical inputs and deforestation to enhance productivity, child labour to reduce labour costs… The producers are trapped in a vicious circle in which a lack of investment and decreasing yields perpetuate low and unstable incomes. In Ivory Coast – the world’s largest producer making almost 40% of global production – the cocoa chain generates 77 cents of societal costs offset on the local population for every euro of value created, because of below-poverty producer incomes, lack of investments in basic social services (education, health…), public spending to fight against child labour and deforestation etc. Based on the analysis of a large number of scientific articles, specialised reports and interviews, this study compares these societal costs of conventional cocoa chains with the results obtained within “sustainable” and “fair trade” certified chains in Peru and Ivory Coast. We learn from this study that certification schemes encounter varying degrees of success, but we can also identify powerful levers for sustainability. “Sustainable” certification do not demonstate their ability to allow producers to sufficiently improve their income, apart from the payment of a small premium for their conversion. Many fail to increase their yields sufficiently and for those arriving there, the extra work is not negligible. Although it is better controlled, the use of chemical inputs does not decrease. Additionally, the available studies do not yet show a decline in child labor or deforestation linked to sustainable certifications. 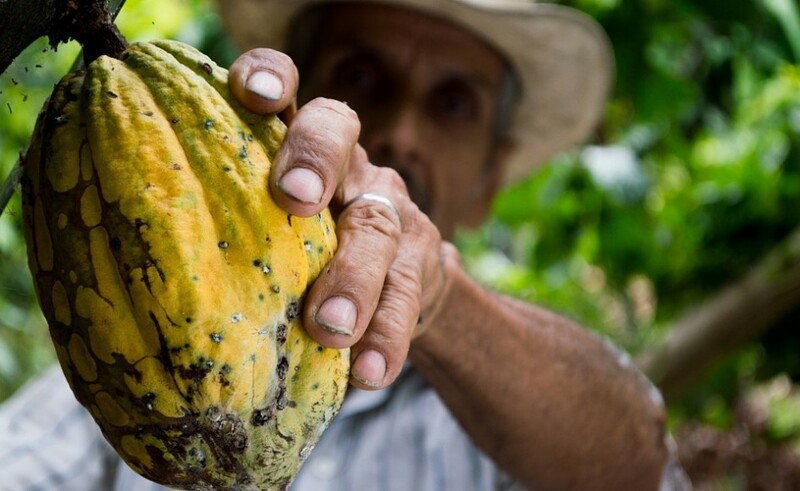 In the end, differences in impact remain small in comparison with conventional cocoa chains. Substantial investments in basic local services and local infrastructures. The successful cases described in the report also rely on alternative agricultural practices, especially agroforestry, and on chocolate chains that value the cocoa origins. When these conditions are not met, the positive impacts are more limited and closer to those seen in the context of sustainable certifications. The results of this meta-analysis remind us that the sustainability of cocoa production can only be achieved through collective and concerted actions inspired by the core principles of fair trade in order to expand its positive impacts to the entire chain. Novethic : Coûts cachés du cacao : le commerce équitable peut-il faire la différence ?